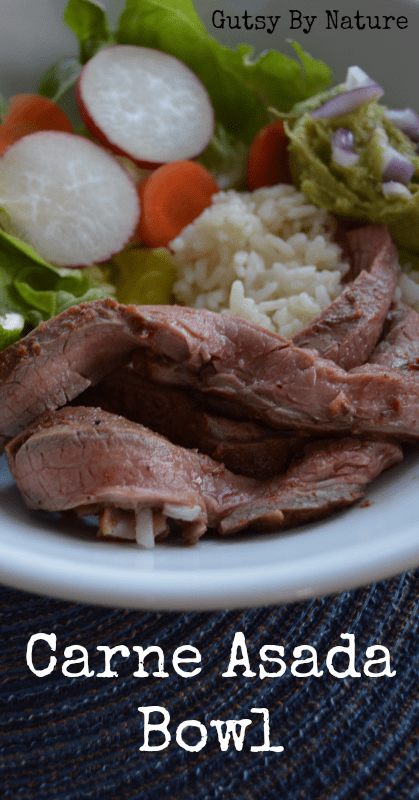 This paleo version of carne asada is a great way to prepare flank steak, one of my favorite cuts of grass fed meat, and when we had a warm early spring day last week I thought it was a great excuse to break out the grill! Though gringos like myself may think it refers to a specific dish or recipe, “carne asada” is actually a generic term that literally translates to “grilled meat” in Spanish, though in northern and western Mexico and in the American southwest, it is understood to refer to thin beef steak that is marinated and then grilled. My version is marinated in lime juice, coconut aminos, garlic, and various spices. If you are following a paleo autoimmune protocol, you can still make this dish but will need to omit the spices depending on your sensitivity and where you are in the reintroduction process. Generally speaking, seed-based spices like cumin are more likely to be tolerated while nightshade derived spices like chili powder and chipotle are more likely to be problematic. For more information, see this post from The Paleo Mom. Instead of serving with the traditional tortillas, I served the meat in a bowl with some fresh lettuce and vegetables and some of my easy guacamole. Since I’ve been playing around with the so called “safe starches” too I also cooked up some white rice, made extra nourishing by preparing it with homemade bone broth instead of water. If rice isn’t part of your paleo diet, either omit it or serve with cauli rice. Credit – This recipe is inspired by Danielle Walker’s recipe for “carne asada burrito bowls” in her Against All Grain cookbook. If it isn’t already in your paleo cookbook collection, it should be! Chipotle is a smoked pepper. I use it because my grill is (sadly) an electric one and doesn’t impart a smoky flavor on its own. Cayenne would work just as well if you don’t keep chipotle in your spice collection. Coconut aminos is available in most well stocked health food stores or it can be purchased online. Paleo Autoimmune Diet (AIP) – Omit spices as indicated above, depending on personal sensitivity. Serve only with non-nightshade vegetables. Low-FODMAP – Omit garlic. Do not serve with guacamole. Specific Carbohydrate Diet (SCD) – Omit coconut aminos. 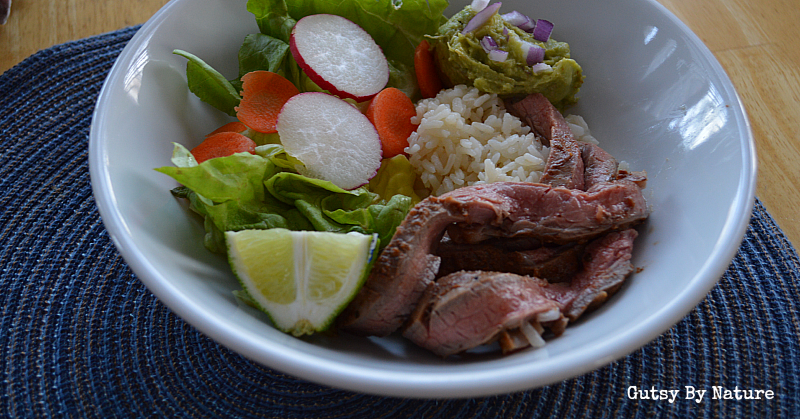 This easy, paleo version of carne asada is a great way to prepare grass fed flank steak! Place all ingredients except flank steak in a blender or food processor and puree. Place the flank steak in a shallow dish or plastic bag, add the marinade and toss to coat. Cover and refrigerate overnight or for at least 4 hours. Remove steak from marinade and grill on first side for about 4 minutes. Flip and grill on other side for 2-4 minutes, depending on thickness of steak and how well done you desire it to be. Remove steak from grill and tent with foil, allow to rest for 5 minutes. Thinly slide the meat against the grain. Serve with salad, guacamole, rice (if desired), and any other desired accompaniments such as salsa or grilled vegetables. Click here for even more great BBQ recipes!